As teachers, we are always looking for new ways for students to introduce themselves. Most of my professional and technical writing courses incorporate social constructionist perspectives. Now, when I begin my courses, I ask students to introduce themselves by documenting and describing their workspaces (and places). This allows them to start the course by describing something with which they are familiar, but also prepares them to think about writing in terms of a situated activity. I. First I have archived some examples (from students that have cleared me to post them). II. And second, I have shared a basic version of this assignment. My name is Alex Adrian. I am the Lead Online English Teacher for Scottsdale Unified School District’s eLearning and SOL programs. My workspace is very special to me because I spend more time at this desk than I do in my bed. 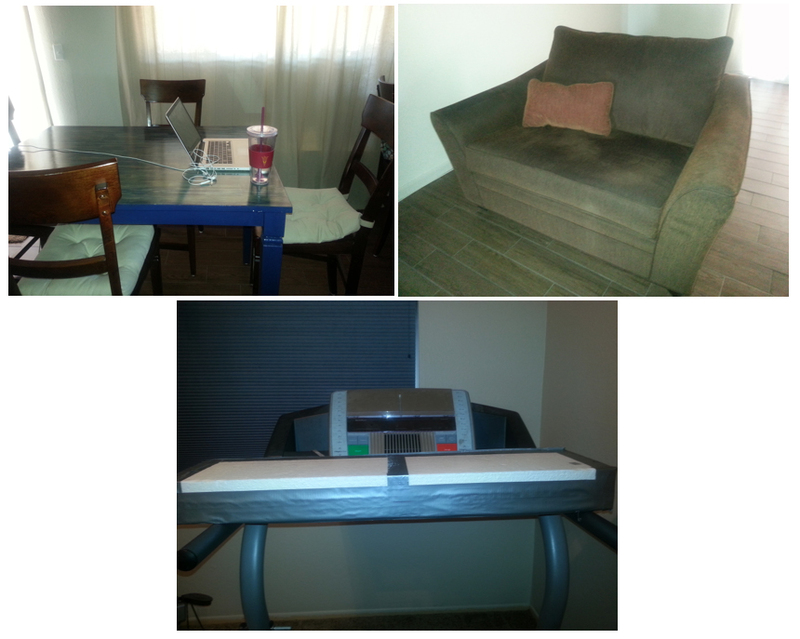 I am seated at this desk for hours upon hours every day, so I needed to make the area not feel like a work desk. The pictures and other small pieces allow me to lean back in my chair and forget about work for a few minutes a day and just reminisce about great memories. It may look to some like a clustered mess, but this is what I like to call my organizational mess. It takes others minutes to find something on my desk that takes me seconds to find. My name is Dennis Mitchell, and I write in a few distinct work and academic roles: in my full-time employment as “Institutional Research Analyst” at Mesa Community College (MCC); as a part-time English composition adjunct faculty at the same college; and as a graduate English Rhetoric and Composition Student, currently at Northern Arizona University. 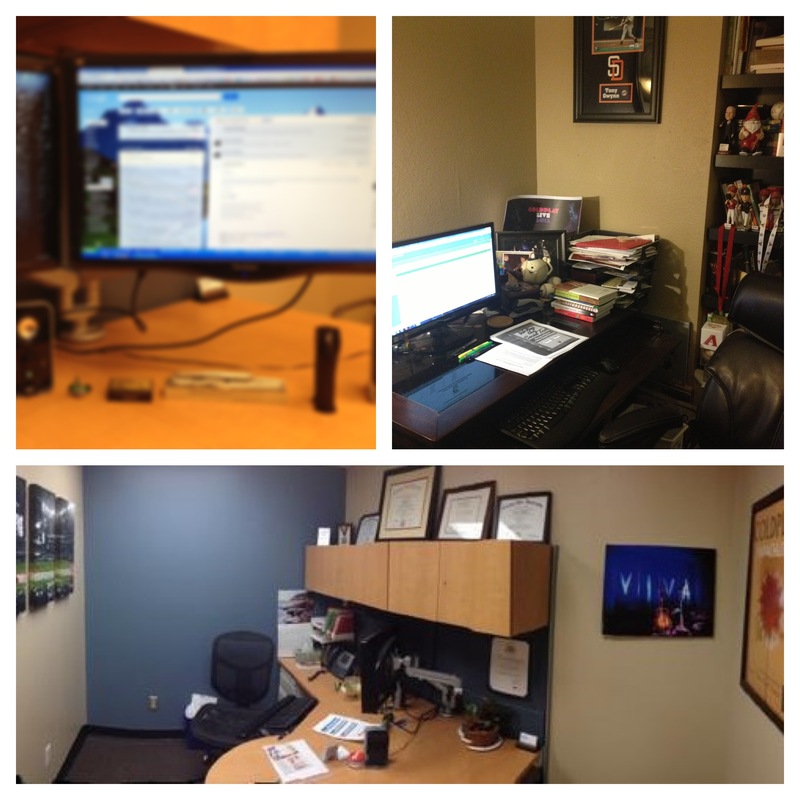 The top left and bottom pictures of my mashup capture my office at MCC. I spend the vast majority of my workdays starring at the two monolithic monitors hanging above my desk; a picture of a favorite place (Chase Field) and other trinkets help the office feel more comfortable. The two monitors help display many data sets and reports at once to assist in the creation of my own work-related texts. Interruptions emanate from my email inbox, coworkers, boss and uncomfortable office temperature, and I occupy this workspace during a typical weekday schedule. While this office is primarily used to construct work-related texts, I do use this workspace to compose faculty-related or student-related texts during breaks or after business hours. My home desk occupies the top right of my mashup image: one monitor with stacks and shelves of papers, books and baseball memorabilia. Creating texts in this environment faces distractions from my dogs (a chubby Chihuahua and a black lab mix), my significant other, household tasks, the TV in the nearby living room or noises outside. My name is Ramon Lira. I work as an academic advisor and ESL adjunct instructor at Phoenix College. I’m currently taking additional English courses through NAU to be eligible to teach other areas such as composition and creative writing. My workspace is a desk in a spare bedroom, which I share with my wife. 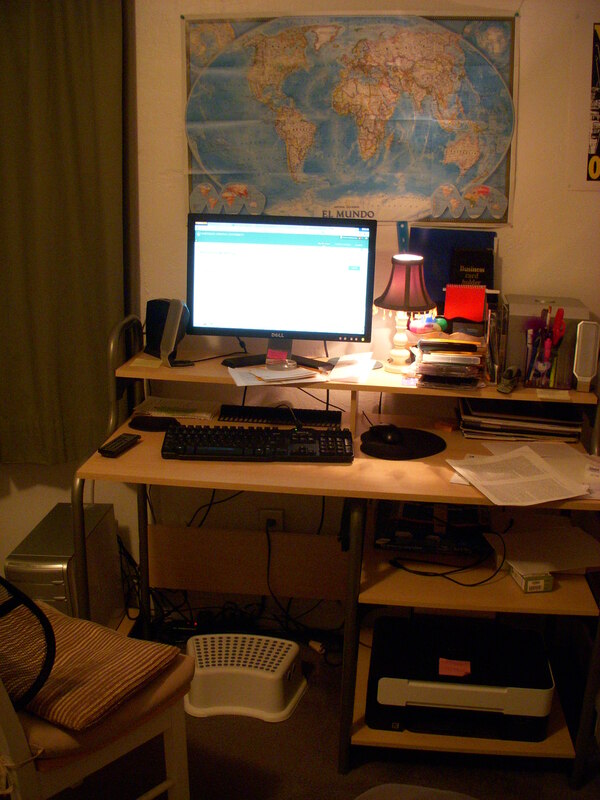 The desk is simple, with only “useful” clutter such as paper, pens, a small lamp and computer equipment. To the right is my collection of some interesting things I’ve collected over the years, such as a paper mache replica of a mummy and a Michael Jackson skeleton figurine, both of which I picked up while visiting my wife’s hometown in Mexico. My name is Anthony Garcia and this is my first semester at NAU in the graduate professional writing certificate. I currently work in both the public school and higher education settings teaching English. This fall I will be transitioning exclusively to teaching in the higher education setting at Tidewater Community College and Old Dominion University, in the Norfolk/ Virginia Beach area. The picture of my work area is necessarily basic, but arguably complex. This is my work environment in the public school that I teach in. The work area is extremely basic where only the humming of the HVAC system keeps me amused. 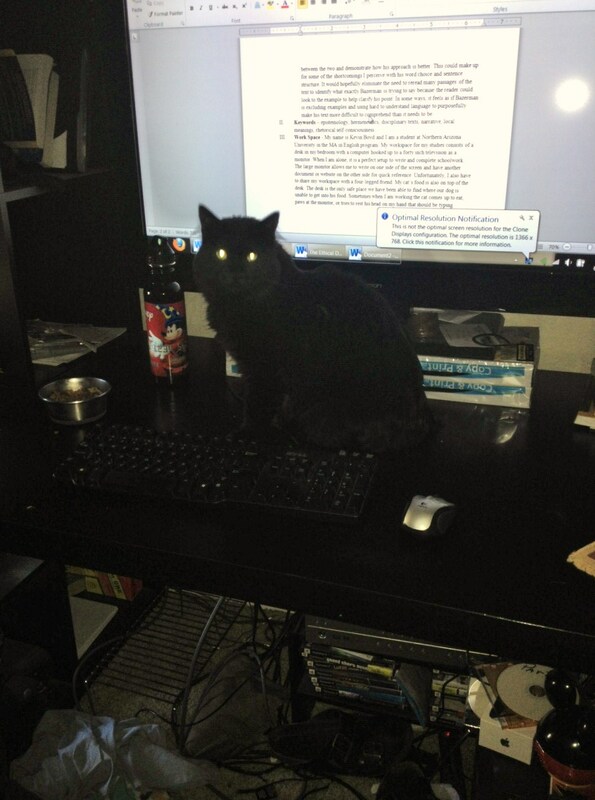 I do not favor a generic work environment for getting most of my writing done. Instead, I prefer the white noise of coffee shops, kids playing in a pool, or the waves rolling onto the shore. For this reason, I’m returning to higher education in the fall where writing, grading, and conferencing with students offers more flexibility. My name is Kevin Boyd and I am a student at Northern Arizona University in the MA in English program. My workspace for my studies consists of a desk in my bedroom with a computer hooked up to a forty inch television as a monitor. When I am alone, it is a perfect setup to write and complete schoolwork. The large monitor allows me to write on one side of the screen and have another document or website on the other side for quick reference. Unfortunately, I also have to share my workspace with a four-legged friend. My cat’s food is also on top of the desk. The desk is the only safe place we have been able to find where our dog is unable to get into his food. Sometimes when I am working the cat comes up to eat, paws at the monitor, or tries to rest his head on my hand that should be typing. My name is Selina Reid, and I am in the Rhetoric and Teaching Writing (RTW) program with NAU. This is my first semester as a graduate student, although graduate school is my area of expertise. I currently hold a staff position at Arizona State University in the Graduate College, where I’m a jack-of-all-trades, helping students, applicants and academic units go from application to graduation. I specialize in dealing with international students, international transcripts review, and I issue I-20 documents which allow international students to apply to get their student visas and study in the United States. My workspace differs according to what tasks I need to accomplish. Much of my reading is done while walking on my treadmill. You can see my makeshift foam and duct tape “desk” that I rest my books on. I studied and read throughout my undergraduate career this way and I am convinced that walking and reading makes me learn more efficiently. The big, brown chair is the latest addition to my reading and studying workspace. This chair is only for lazy, non-serious reading and writing. This is not a schoolwork chair. The kitchen table is the best workspace for writing and doing school assignments. I like being next to the kitchen and family room while I work, but sitting at the table forces me to get down to business, unlike the comfy chair. Since I am not permitted to take a picture of my workspace at Gore, you get to see my workspace at home. My name is Steven Seamons. I am an associate at W.L. Gore & Associates, and I attend NAU. At this workspace I am a father of 4 (2 girls and 2 boys) all under the age of 8, and it is very hard to find a free minute, or at least quite free minute. For this assignment you get a glimpse of this workspace in all of its glory. On closer inspection you can see we have a lot of coats. We live in the mountains and we are always in need of an extra layer, my workspace is also the coldest spot in the house. I have to wear socks so my feet don’t turn into ice. 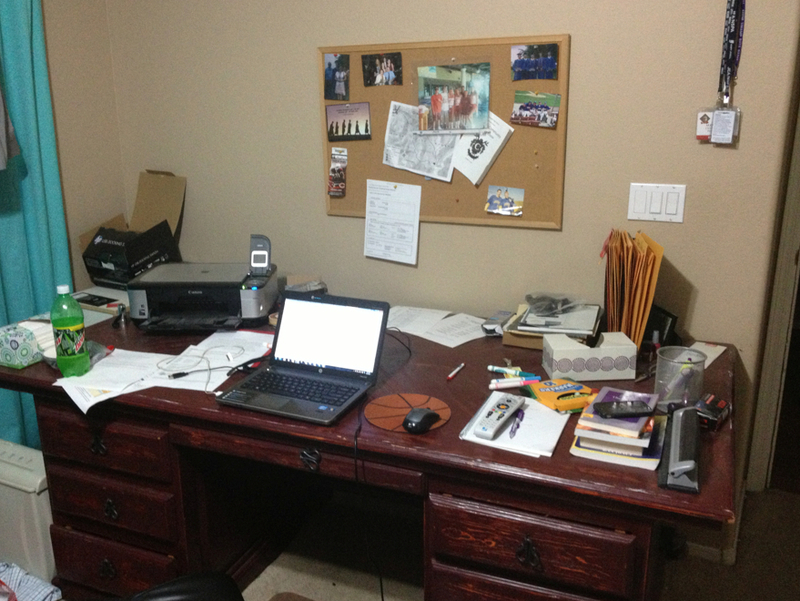 This workspace is most commonly used for storage of bottles, crayons, children’s art, and supplies for runny noses. My undergraduate self of 8 years ago would be shaking her head in disbelief if she saw this. 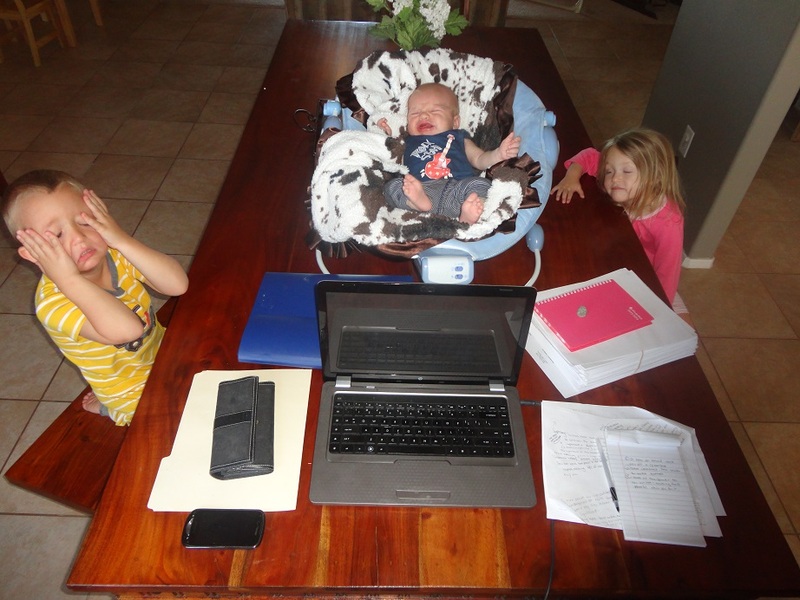 Gone is the idealistic dream of what I thought my home office would one day be like when I became a mother and a teacher. Instead, on what doubles as my dining room table (my favorite piece of furniture, witness to countless family occasions with all the people I hold dear) there sits what appears to be a mess. On the contrary, I promise, it is actually an organized chaos of bills, business paperwork, and now, as evidence of my jump back into the academic world, endless amounts of English classwork. It is a place that is uncharacteristically peaceful for me in the early morning hours and afternoon naptime, knowing the most precious things in the world to me, my twins 3 ½ and new baby boy, 8 weeks, are sleeping soundly in the rooms within earshot. It’s true that this is probably not the most convenient home office for a student, business owner, mother, and former English teacher, however, the views are great and the kitchen (copiously stocked with cereal, coffee and beer- essentials for every busy mom) is close by, so I can’t complain. I work in two separate environments in distinct capacities. 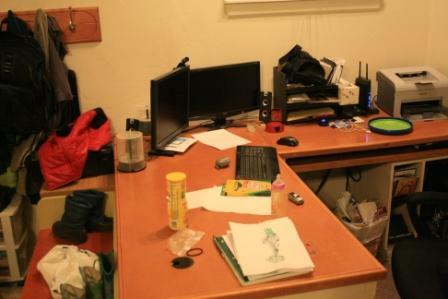 The larger and more vibrant image is the space in which I free write and work as a student. It is my game station and link to the world and all its ills. Books and images surround me, things representative of who I am—tiny Batman figurines, a replica of Sting from The Lord of the Rings, and the desktop image of a Black Mage from Final Fantasy. 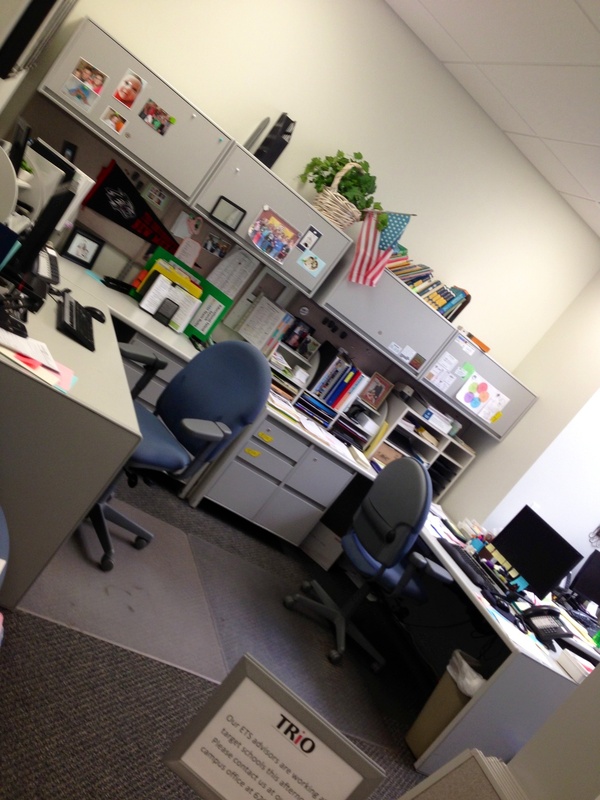 The other half is my workspace at Undergraduate Admissions and Orientation at Northern Arizona University. At this place I maintain an orderly environment with minimal personal conveniences. I keep it neat so that if I need to move it isn’t a hassle. The small flashes of personality are random holiday gifts we receive in the office and, of course, a fantastic image of Tremors as my desktop background. It is here where I write procedural documentation and the occasional essay for school. I share an office in the communications building with another faculty member, which is the typical setup; offices are located at each end of the building with classrooms in between. I spend many hours writing in this space, most recently developing student and instructor materials for the college’s new student success course, which just completed its first year of implementation. Sometimes I work through periods of concentrated writing activity, and other times I engage in conversations with colleagues, students, and administrators. I usually place work on the desk to the left of the computer, which I removed in order to give this picture a cleaner look, but I am fairly neat in the way I typically maintain my writing space. I enjoy writing here and the relatively quiet location at the end of a hallway. I also enjoy the close proximity of a window, glancing out of which provides an occasional quick break when needed to reenergize my writing. 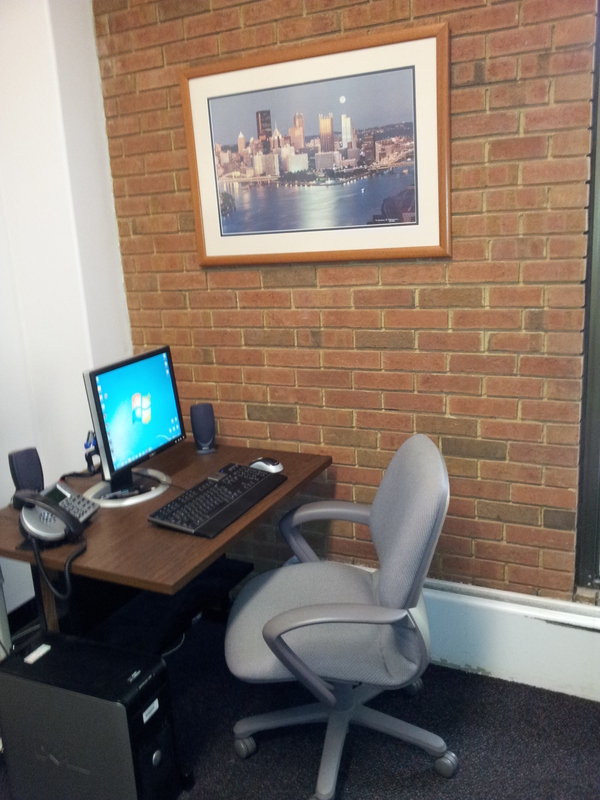 Our office and my desk are hidden away in the basement of the administrative building on campus, but I like it that way. It allows for our small staff to work together without distraction and shields the outside world from the chaos that we often create. Our writing takes many forms and those texts create action. That action is often noisy, causing the rest of the college campus to appreciate the existence of a “lower level”. I have a distinct area for my own creative processes, but I share the larger communal space with two other staff members. I find it both comical and telling that we regularly communicate through text via internet signals and computer screens when we sit within inches of one another. My name is Jesse Maloney, I’m a substitute High School teacher at Greyhills Academy High School and graduate student at Northern Arizona University. The place where I like to conduct my school work now that it’s summer is at the bar in our outdoor parlor. When I put on some surf shorts and a basketball jersey it’s a serene warm setting even at night and I don’t feel cooped up and stressed. It helps to lose track of time and get quality reading and writing done with my heavy semester. 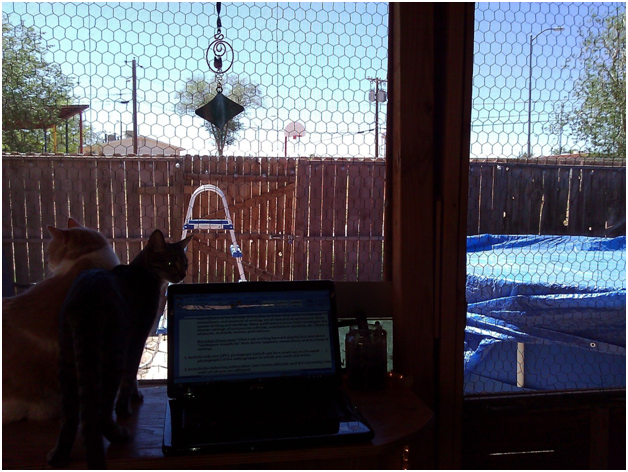 We all, likely, have multiple places in which we work and in which we read, think, and write. This assignment asks you to document and describe the key features of your environment at one of those “places”. I put “places” in quotations because it may be a fluid and dynamic location. You can, and should here, think of work places and spaces as both a physical location, but also as a time-based location. What else is potentially at play? For example, do you share the space with others? Is there anyone else competing for that space? Are there interruptions? Etc. To think about reading and writing as things that happen in spaces, in locations, in specific time periods, is a unique way to introduce yourself to others in the course. Follow these instructions. This firs assignment will also prompt you think about the production of texts as a literal and situated act that happens in real locations. And it will help you get to know your classmates a bit in order to jumpstart the formation of our classroom community. With this in mind, I was recently inspired by the discovery and playfulness of a blog: http://nathanmeunier.com/2012/06/22/shop-talk-freelance-workspaces-volume-1/ that invites writers to send photographs and brief descriptions of the settings and spaces in which they work. As teachers, researchers, and students of writing, we all spend endless hours in these spaces writing and working. 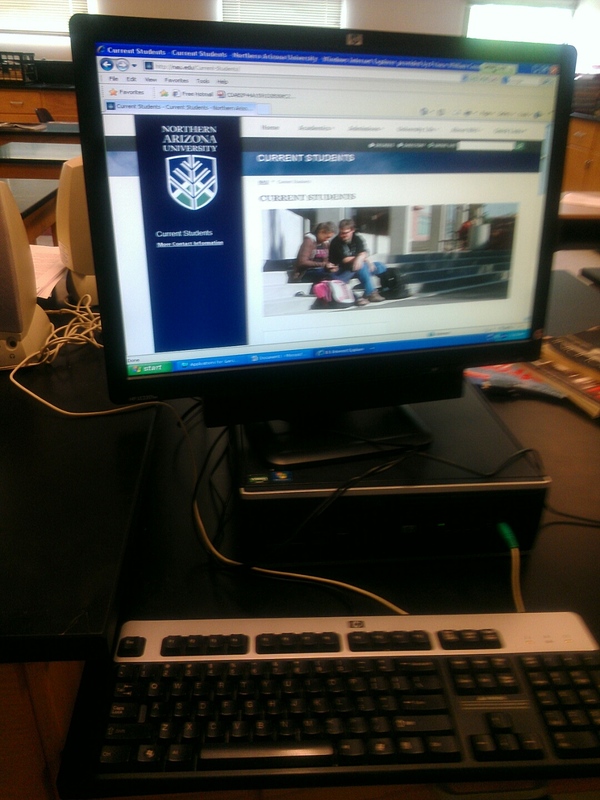 See my example at: https://acomposing.wordpress.com/2012/06/22/the-work-spaces-and-places-of-writing-teachers-researchers-and-administrators/. Consider how my example is primarily playful. Feel free to be playful yourself, but also focus on including some serious forms of analysis about some aspect of your workspace that is worth comment. So, tell us a bit about your workspace. 1. Include only one (JPG) photograph (which can be a mash-up, multi-panel photograph) of the setting/space in which you work and write. 2. Include the following information: your name, title/job, and the university/school with which you are affiliated. 3. And include a short description focusing on what you find most interesting to describe/share about your workspace. 4. Post your narrative for the class to see. Remember: Write it in a fashion where you feel comfortable sharing publicly. Do not include details that you don’t want others to know. Do not include details that you might consider too personal for some reason. After I first read Myer’s book, I came to appreciate the evolving generational differences in the forms of literacy education. They became apparent, for example, in my own family as I grew to recognize that my grandfather was taught a form of literacy that valued different kinds of “reading” than my own. 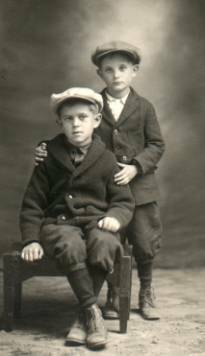 My late grandfather, Robert Koshnick, was educated in a rural Minnesota one-room schoolhouse during the early 1900’s. Throughout his childhood, he was taught printing through tracing and replication (a significant overlap between his education and my own grade school work), but he was also taught to memorize and recite long passages of both prose and poetry. This emphasis on memorization (recitation on Myer’s chronology) was no longer valued by the time I was in grade school. Whenever he would quote Tynneson, Poe, Robert Service, Yeats, etc. I envied him because I did not share his ability to recite tens of poems by heart. As Myers’ book argues, translation captures aspects of our current literate practice. The ability to translate, i.e. to summarize, re-symbolize, and transfer information from specific sources for use across shifting social, political, and professional contexts takes a great deal of training and practice to do well. Given the power and relatively availability of increasingly “hand-held” search engine devices, via Google, etc. we can find vast stores of information instantaneously -the primary skill that must be emphasized, given these trends, is to interpret and repurpose that information for shifting purposes and audiences. Where once we stressed honoring established works of poetry and literature as aesthetic and moral achievements -when we include such works now, we value instead the ability to: a) decode, and therefore learn from them; b) to summarize, and therefore symbolize for renewed intentions and purposes. These abilities do not require memorization, or recitation, largely outdated forms of literate practice. My teaching practices in reading and writing have been utterly influenced by my understanding and appreciation of a translation literacy for modern, functional, goals and outcomes. And yet, inspired by the legacy of my grandfather’s (recitation) childhood literacy to memorize and recite poems, I have, and continue to, dedicate myself to such learning. I have done so on my own terms as an adult and often with the sneaking suspicion that -although outdated- my own childhood was intellectually malnourished by the loss of such practice. 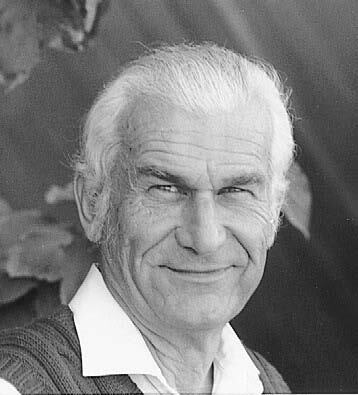 Sure, admiration of my grandfather has influenced my perspective, but for years I could sense, but could not adequately explain why the ability to recite poetry in particular felt so important and powerful. When I was introduced to the concept and term “gignomai” however, I was suddenly able to both establish and explain just what happens when we hone the ability to memorize and recite specific passages. Ever since, when teaching those courses in writing that are explicitly grounded in the humanities, I have included the following assignment in my courses, with the following explanation of its value. This is what I expect of this assignment. You are to enter into the work – populate a poem with your own identity – bring together two realms – you and a poem – until they become each something a little more familiar. A good poem is an introduction to the world. In medieval times, a poet was called ‘a maker’. According to this understanding, a poet makes the world. And, in a way, every story, every poem is a form of making and re-making the world. Such stories, however small, are not fanciful, complete fictions – rather, they inform us about the world. They tell us how we live, often in surprising and sobering ways. Consider for a moment the Greek word: Gignomai –born of ‘gnosis’ or “knowing” it is commonly known as the form of knowing that is ‘to become’ -a from of knowledge whereby you become that knowledge. Gignomai, or knowing, in this sense, is a happening, a becoming. It is to take within, and a transformation occurs. Memorizing poetry – the act allows a poem to enter fully into your self both consciously and unconsciously. It transforms your views in particular instances because you can call on the relationships inherent in a poem, to evoke a feel, or felt sense, of knowing particular words, or situations more immediately and fully. And so poetry is a happening, a making in a very sincere sense. Poems also entertain. When you memorize a poem, like learning to play a groovy song on the guitar, you may find yourself reciting it (to the amazement of others) around a campfire, or to yourself when you are stuck in traffic waiting patiently. 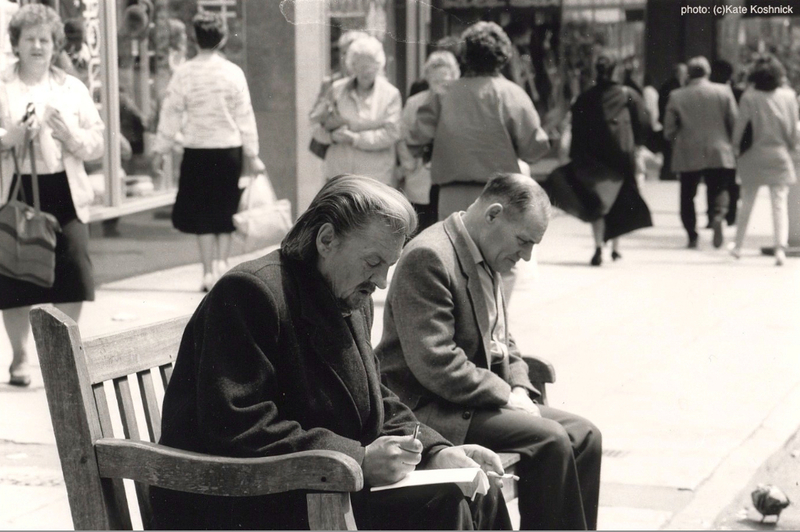 Many people who memorize poetry often say it can be comforting at times, to have something familiar to recite much like a secular form of praying. The act offers an immediate connection with some part of the cosmos. What follows below is the assignment and some suggestions on memorizing. But first read this entry from Karen McCosker’s book A Poem a Day. Recalling what he knew oriented my father. The poem gave him breathing space in the crowd, and time to recover from the anxiety of feeling off balance. Hearing the words he had memorized helped him make his way because they suggested an an association between the strange place and the familiar poem, gathering up the distance between Athens and his upstate New York home. During the course of this term, you are expected to memorize 2 poems of at least 15 lines. You may also choose to memorize specific lines from a play of the same minimum length. On the day of the quiz, you will clear your desks and write out the poem on a piece of paper. You will have roughly 8 minutes to write the poem out and hand it in to me. You must demonstrate a near perfect transcription for full credit. Each quiz is worth 5% of your grade. This is an all or nothing assignment. Minimal word variations in several lines is acceptable such as articles omitted or substituted: ‘a’, ‘the’, ‘an’ and a couple (meaning 2 or 3) word variations will be allowed. Form, word, spelling and meaning must remain wholly intact in at least 14 our of your 15 lines for credit. This includes knowing the line breaks throughout your poem. You must choose and hand in a typed copy of the poem (or lines of play) to me roughly 3 weeks before quiz day. Unless you are very talented, DO NOT try to memorize 15 lines in one night! This kind of exercise will take at least 4 concentrated sessions to learn fully. Than blood in the heart. death by avalanche, birth by failed contraception. the sod and caprice of landlords. let me bash out praises — pass the tambourine.